Texturing is a little redundant, a lot of light brown colors. Some edges could have been better aligned. But nothing looks real ugly, or inconsistant. Architecture isn't bad. Some trim work for ledges would look better. The map is not boxy, but not extravagant either. There are some nice tiles and blocks set to show some crumbling of the ancient structure. Some of the light sources look goofy. Lighting is brighter in the central room than what is provided for light sources. The blue light from the sky could have lit things up more, but was kept close to the opening in the ceiling. The rest of the map is light up well, and has the appropriate light sources, although I think the lights could be a little darker for better effect. A little disappointing to see, or hear rather, that the only ambient sounds are that of the lava. Rooms are zoned off, and no errors. There are some nice traps placed in the map. One crushes those who dare to go for the rocket launcher, that's if it is triggered. Another one will dump you into lava, which only has one trigger, and the bots never really cross it. No other traps, but the U-damage is placed behind triggerable bars, but the bots can never get to it either. Gameplay lacks a few things. For one, the bots hardly go in the area where the flak cannon is, and don't ever grab the flak cannon itself, most likely because it's sort of a dead end, but you can still jump down to the floor below. The shield belt, which is in the same area, was never gotten to by the bots that I saw. Flow doesn't need any work, except for maybe the dead end at the flak. No problems with item placement, other than the Keg-of-health is in the open, and what's with the chainsaw? Invisibilty is hidden well, and the bots can get to it. As I said above, the U-damage is placed well, but the bots can't get to it. The main thing is, the map is fun, and worth the download. Certainly could use some improvement, but then what map doesn't? A pretty cool map. 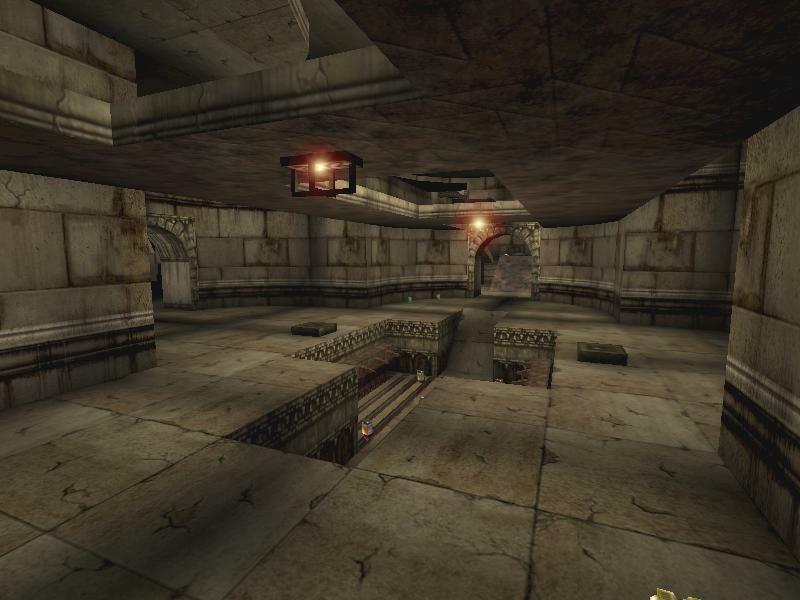 Bots are pretty vicious on this map so you might want to bump them down a skill level or two from what you usually play them on. The RL is placed in a trap that can be triggered from multiple places, so watch out! Overall a very cool map. This one's a classic, no wonder it's not as good anymore. But I like the look of it and it plays well, though I seem to prefer the DOM version a bit more. Help, somebody! !~ Here we go again...a romp down Memory Lane. But first, for your reading pleasure, a three year old review. Mighta been from "Mapped", "Nali City", or another PlanetUnreal hosted site of the time. Don't recall. Allow me to start this review by saying one thing.... This is a very fun map! It really is. It may not be a "Hall of Giants" or "Morpheus" kind of great... but it's very good none-the-less! 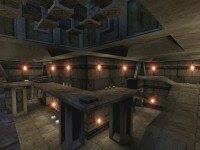 The level is some sort of arcane temple type place with lava in the basement and sniper ledges underneath sky-windows. It has an excellent flow with twisting and connecting paths centered around a room with one truly neat piece of hardware.... a giant metal crusher! Graphically, there is nothing new here. Also, the polygon count is low, so don"t expect too many extremely detailed objects. These facts are easily dismissable once you"ve played through level a few times with a few of your friends. As a matter of fact, some of the more simplistic surfaces guarantee this map will run at a very good frame-rate at all times. The metal crusher is a very nice touch. In its maw is a rocket launcher with rocket packs, making it very tempting to risk instant death for such a weapon. However, buttons located outside, can be triggered by any other player, activating the crusher and causing grievous bodily damage to those inside. The one complaint (which might not really be a complaint) is that the Redeemer is placed in a spot which I can"t figure out how to get back out of alive. This makes it not worthwhile to obtain the Redeemer (but, perhaps that"s the point ;). Anyway, enough ranting. This is a fun map.... one which I think you should download right now. 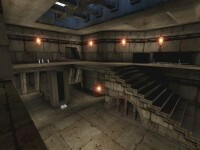 Get some friends together... and go rampaging through this excellent deathmatch map! So we had a solid 8 a few years ago and now we have a 5. Why is that? 'Cause the map is old? THEN REVIEW MORE FRIGGIN' NEW MAPS THAT ARE GOOD, ALREADY. ARE THE NEW MAPPERS THAT BAD? IF THEY ARE, THEN ARE THERE NO OLD PROS DOING NEW MAPS? Sheesh!! That's my whole point weasel. Like I said above, where are these new maps that have raised the standards?? Was never that keen on it though. Still, it's quite good.